HA! You sure your not one of my professors? I just voted yes! You all convinced me! Go Mean Green! Time to take it to the next level. Woo Hoo! Through the Good and the Bad. Wouldn’t have missed it. I remember thinking, need to show up for the Seniors and Coach Chico. I think he cried after alma mater was over! Didn't we have a punter that was supposed to be Keena replacement, Sam Aguilera I think was his name. Agreed. They need to create noise in there, otherwise it would be awfully quiet in there. How many promotions are they going to have during timeouts? The UT SA chant is annoying. Shoot San Antonio is annoying. Can't wait too get out of this place. An obvious illegal pick not called that allowed the TD. Here we go again with refs! I don't wanna hear IT!!!!! Great Win tonight. I think the secret is not to bring Scrappy! LOL. I didn't see him tonight. Where's Scrappy? If I'm not mistaken this boot is in deep south Texas in the town of Mercedes, Texas. Unless I missed him, but I did not see Dajon Williams in pre-game warm-ups. Correct me if I'm wrong. For choosing to wear the black uniforms, that gets recruits to choose UNT over other schools. Ohh wait then the game starts, and we are getting spanked. What upset me is no sign of anger from Mac or anyone that I saw towards the Rice coaching staff when they scored with 1:00 minute left in the game when the game was well in hand. Rice could have easily kneeled the ball, but they didn't. I sure hope Mac told Balliff something, but from what I saw there was nothing but back slaps and praises. Mac should have stuck up for his team. I surely hope I am wrong in my assumptions that Mac said nothing about that last TD by Rice. Worst tackling I've seen under Skladany, it also looks like we have two left feet. Maybe it's too cold for us. I saw Rex Rollins come out of the tunnel to the sidelines during the 3rd quarter with a sling over his left arm and his pads and jersey were being carried out after the game. Hope it's not a season ender. 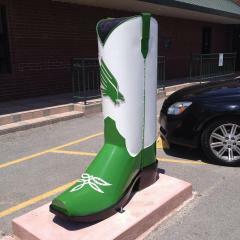 Boots of Texas universities are being placed around the city of Mercedes, Texas, a city in deep south Texas, and this is one of their newest ones.